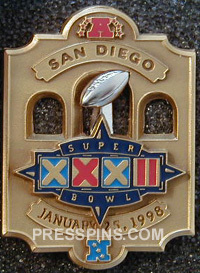 San Diego Super Bowl XXXII (January 25, 1998) Player Pin. This pin is limited. Only 350 were made. This pin, given to players and coaches before the Super Bowl, grants the holder access to the hotel.